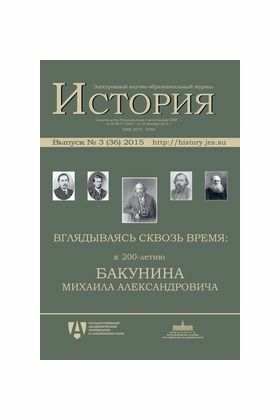 After the publication of collections dedicated to the 200th anniversary of Alexander Herzen and Nikolay Ogarev in Electronic Science and Education Journal «Istorya» it would be logical to conclude this small series of commemorative issues with materials about the person who was closely related to them – the great rebel Mikhail Bakunin. Bakunin saw statelessness as an optimal social structure. He believed that deconstruction of any form of state was supposed to be a prelude to social justice; liberated people would have all the opportunities for self-fulfillment. But the historical process developed in other ways, and the principles of self-government and democracy were mostly perceived as a mind game, a sort of whim. Meanwhile, some countries such as Switzerland where these principles have been applied to some extent have displayed the most stable social system efficiency and proved to be the least prone to social upheaval and participation in international conflicts. Obviously, the Mikhail Bakunin’s ideological legacy created through his intense and passionate search, struggle, successes and fails contains a hard-won and at the same time rational position extremely unwise to forget. The authors of this volume (many of them also published their works in the two previous editions) have studied various aspects of Mikhail Bakunin’s ideological heritage and practical activities. The volume discusses the essentials of Bakunin’s doctrine, his influence on the revolutionary movement, and other narodnik and liberal thinkers’ attitude toward Bakuninism as well. The historiography of Mikhail Bakunin’s anarchism is touched upon. The participation of colleagues at several leading Russian centers for the study of social and the narodnik movements speaks for the undiminishing significance of the topic.